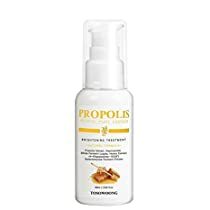 Propolis is one of the materials that composes of honey comb and honey bees make it as mixing their own saliva and enzyme with vegetable sap and pollen. Honey bees protects themselves from various harmful elements as putting propolis on inner and outer surface of honey comb. It is a valuable natural ingredient in full of mineral, vitamin and amino acid and only 1/200 amount of propolis can be collected compared with the amount of honey gained from one honey comb. It is a skin-friendly ingredient that is effective for lifting and protecting skin from outer harmful factors. It is especially suitable for sensitive skin which cannot be mingled with any common cosmetics and rough skin in needs of intense moisture. Also, it is very helpful to take care of skin which has sensitive reaction from outer stimulation. How to use After toner, take an appropriate amount and apply to all over the face and dab gently to absorb well.